This Tuesday, August 19th from 11am-3pm, join social media platform Influencer to celebrate the launch of Donna Karen’s latest perfume, DKNY MYNY, a new scent featuring notes of raspberries, vanilla, musk and Egyptian jasmine. Meet Rita Oraa, the face of the campaign, who will attend the event at Madison Square Park in NYC, and will be joined by other celebs including Rumer Willis, Hannah Bronfman, and Dominique Ansel. Guests who attend the public party will be treated to a variety of free goodies. 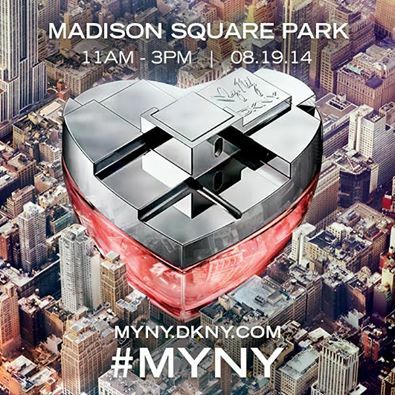 First, free samples of the new DKNY MYNY fragrance will be handed out. Next, Dominique Ansel, the creator of the cronut, will be giving out around 500 yummy heart-shaped gourmet pretzels, inspired by the heart shape of the new fragrance bottle. The pretzels will be covered with raspberry sugar and come with whipped honey butter dipping sauce and fresh raspberries. Guests will also have the opportunity to create their own MYNY HEART and memories. This event is free open to anyone.